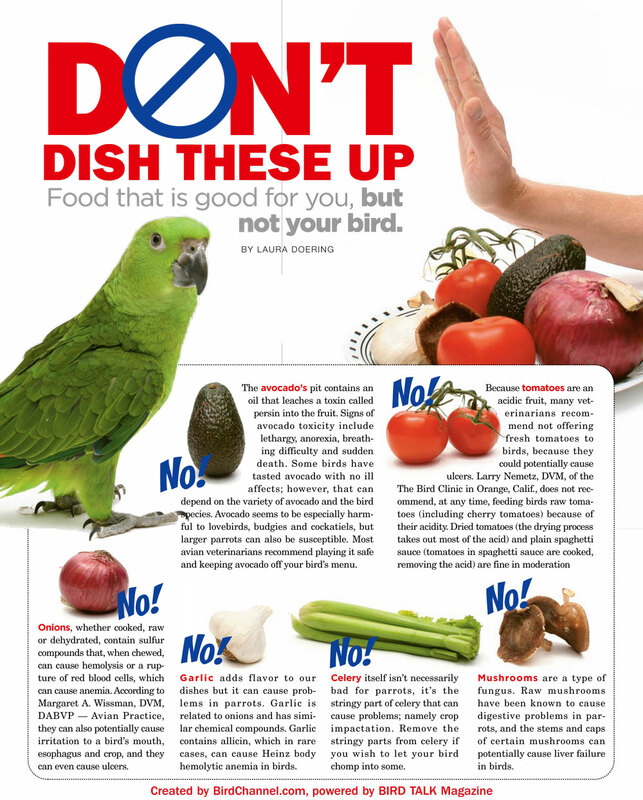 Below is an excerpt from the above mentioned website listing toxic foods, plants and woods for our birds. Please note that the items marked with an* are especially toxic to birds and can be fatal.Toxic foods are foods that can cause allergies and/or health problems in birds. Anything high in sugar or salt is inappropriate, as are fatty foods. More serious are things such as chocolate, which is toxic to many pets. Caffeinated or alcoholic beverages are also dangerous. I provided additional information as was available. Oleander aka Rosa Laurel Toxic Principle:Seeds, Vase water, Whole plant, Smoke from burning, Cardioactive glycosides Clinical Signs:may cause diarrhea, nausea, vomiting, slowing of heart-rate, abdormal heart beat patterns, heart failure and possible death. Daffodil / Bulbs: Clinical Signs: Can cause severe gastrointestinal illness, convulsions,seizures, low blood pressure and tremors. Oleander aka Rosa Laurel Toxic Principle:Seeds, Vase water, Whole plant, Smoke from burning, Cardioactive glycosides Clinical Signs: may cause diarrhea, nausea, vomiting, slowing of heart-rate, abdormal heart beat patterns, heart failure and possible death.